Micronutrient deficiencies are common in HIV, both in early and late stages of the disease. Tomaka  found in 129 patients with stratified T-cell counts all cohorts had similar prevalences of nutrient deficiencies. Among the three subgroups (CD4>500, CD4 200–500, CD4<200), each had similar occurrence of deficiencies: 38, 41, and 42 percent, respectively. Beta carotene and selenium figure prominently in these deficiency pictures. Their role as antioxidants provides a logical explanation for the widespread deficiencies of these nutrients seen in HIV and their therapeutic relevance. Deficiencies of serum and plasma beta carotene and other carotenoids (including lutein and lycopene) have been observed in multiple studies in both HIV-positive and AIDS patients. [4, 7, 8] Depression of serum beta carotene levels is usually indicative of fat malabsorption and diarrhea, common complications of AIDS, secondary to general malabsorption, infection, and altered gut barrier function. While pancreatic function appears to be normal in HIV/AIDS,10 enterocyte function and villous atrophy occur even without intestinal infection. 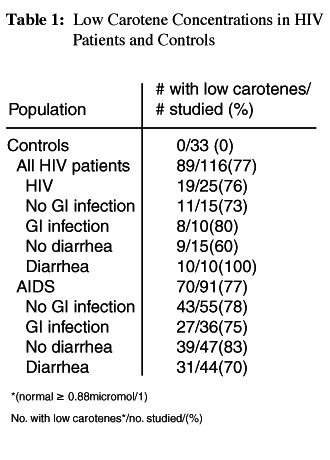 Ullrich,  in a cohort of 116 HIV-infected individuals, found serum carotene concentration did not differ significantly between AIDS-diagnosed individuals who had diarrhea and those who did not: 77 percent of both groups had abnormally low carotene levels. In addition, serum carotene levels did not differ between HIV/AIDS patients with or without the presence of infectious agents in the stool or on intestinal biopsy: 76–percent infected and 77–percent noninfected individuals had abnormal serum carotene levels. The presence or absence of weight loss, fever, or secondary extra-intestinal infection did not correlate with alterations in serum carotene level. See Table 1. In this study, CD  percentages (r=0.364; 95% CI, 0.194–0.513; p<0.001), CD4 count (r=0.28; 95% CI, 0.101–0.441; p=0.0013) and the CD4/CD8 ratio (r=0.38; 95% CI, 0.212–0.526; P<0.001), (but not leukocyte, lymphocyte, or CD8 counts) in peripheral blood correlated with serum carotene levels. Favier et al  examined a cohort of 25 asymptomatic HIV-1 seropositive subjects in CDC stage II (mean CD4 396/mm3) and 18 HIV-1 seropositive subjects in CDC stage IV (mean CD4 56/mm3) and followed changes in their antioxidant status for six months. They found severe deficiencies of plasma carotenoids and beta carotene in both groups, and a significantly more rapid fall in the level of beta carotene in the CDC II group than the CDC IV group. The authors related this difference to increased levels of peroxidation in CDC stage II patients. Their malondialdehyde (MDA) and hydroperoxide levels were significantly higher (P<0.05) than in those subjects who had more advanced disease (CDC stage IV). They concluded the reduction in carotene levels was the result of increased antioxidant activity at this stage of HIV infection due to overproduction of oxygen radicals by polymorphonuclear leukocytes in CDC stage II. See Table 2. Whether carotene depletion is due to malabsorption or increased free radical load or both, it appears to be consistently deficient in HIV-positive subjects. Omene  measured beta carotene levels in 15 African-American and Hispanic children. Those with HIV had 6.5 times lower levels of serum beta carotene than age-matched HIV-negative controls; the children with AIDS had a 13–fold lower level than HIV-negative controls. There were no significant differences in the levels of serum vitamin A or E in any of the groups. Periquet et al  looked at 21 HIV-1 positive children and found deficiencies of plasma levels of both lycopene (p=0.002) and retinol (p=0.023) but not beta carotene in the AIDS-diagnosed children (n=10). Serum beta carotene and vitamin A levels were measured in 74 pregnant HIV-1 positive women in the first trimester and compared to pregnant HIV-negative women, also in the first trimester. HIV-infected women with CD4 counts below 200 had 37–percent lower mean serum vitamin A and beta carotene levels when compared to controls (p<0.001). Both serum beta carotene and vitamin A levels correlated with percentage of CD4 lymphocytes, CD4 counts, and CD4/CD8 ratios (p<0.001). Lacey  found a significant depletion of plasma carotenoids in 35 HIV-positive individuals compared to controls (p<0.001). Plasma levels of four of the individual carotenoids were correlated with CD4 count, but beta carotene, and vitamins A, C, and E were not. An evaluation of nutrient supplementation in 64 HIV-1 infected adults  revealed that even though 63–73 percent claimed they were taking some form of multi-vitamin, plasma levels of total carotenoids were still lower than the HIV-negative controls (p=0.009). Lower CD4/CD8 ratios were correlated with lower carotene levels (p=0.02). Although the patients in this study who were taking antioxidant supplements had consistently fewer low concentrations of antioxidants no matter what their disease stage status (p=0.0006), 29 percent still had subnormal levels of one or more antioxidant.